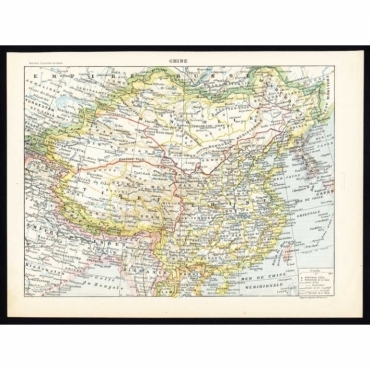 Antique maps of China from the 16th to the 20th centuries. 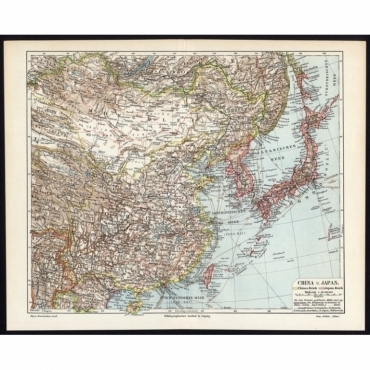 Our collection of antique maps of China includes maps dating back to the Ming dynasty. 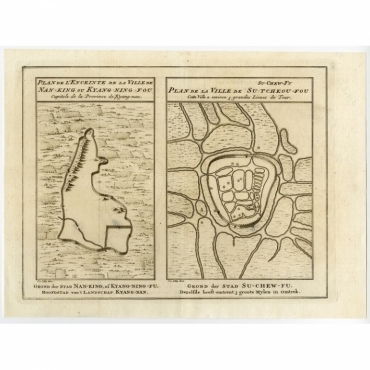 In this period, traditional cartography skills became more refined and different types of maps were published. However, the Kangxi Emperor of the Qing dynasty (1644-1912) realised that the maps lacked accuracy and therefore sponsored a national wide mapping programme. 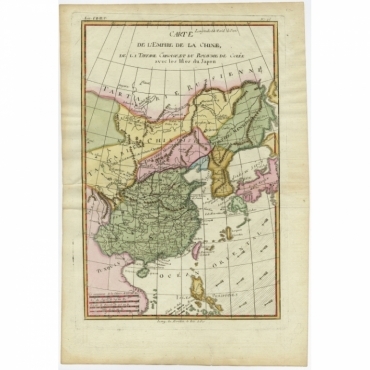 Our antique maps of China reflect these changes in cartography and cover many Chinese regions. Antieke kaarten van China van de 16e tot de 20e eeuw. Onze collectie antieke kaarten van China gaat terug naar de Ming-Dynastie. In deze periode ontwikkelde de cartografie sterk, kaarten werden nauwkeuriger en er werden meerdere soorten gepubliceerd. Echter, de Kangxi keizer van de Qing-Dynastie (1644-1912) vond dat de kaarten nog niet nauwkeurig genoeg waren. Hij sponsorde daarom een nationaal cartografie programma. 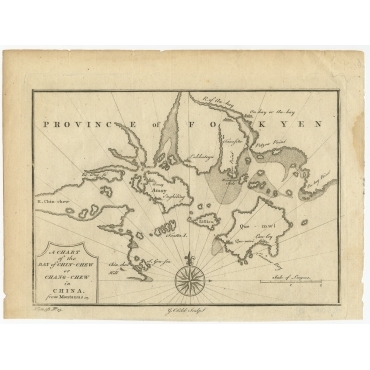 Onze collectie antieke kaarten van China weerspiegelen deze veranderingen in de Chinese cartografie en bestaat uit antieke Chinese kaarten van verschillende regio's. 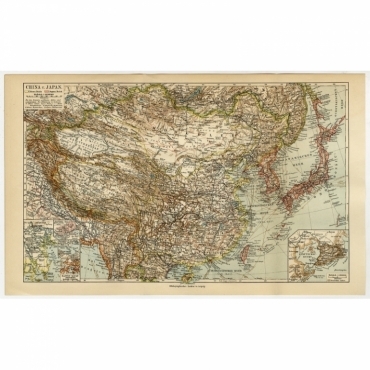 Antique Maps | China There are 61 products. Map 3: 'Nouvelle Representation des Cotes Nord et Est de L'Asie'. 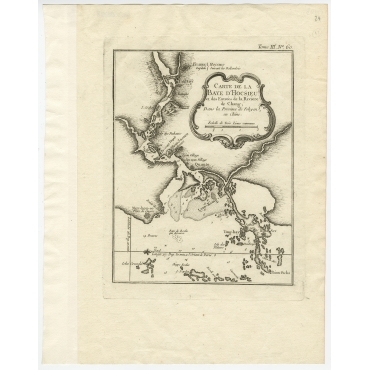 (New map of the coast of North and East Asia.) Three maps on one sheet. Depicting three maps centered on mainland China, Hokkaido and Kamtschadka in three different visions. 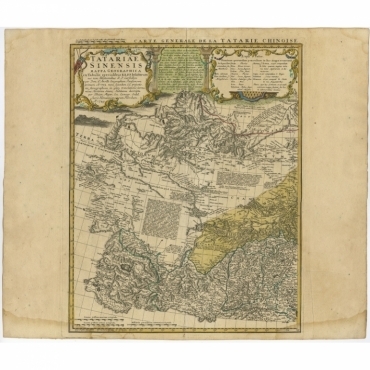 This map originates from the plate section. Sheet: Front: 'Chine.' (China map). Rear: 'China.' (China views, nature, animals, costume). Plate 53 : 'China, Midden en Zuid.' (China, Central and South). Titles: 'Plan de la ville de Hang-Tcheou-Fou ou Hang-Chew-Fu Capitale de la Province de Che-Kiang. 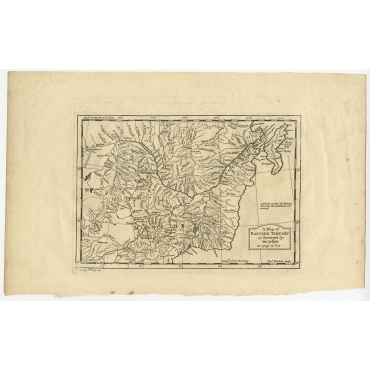 - Grondtekening der stad ...' This original print shows a map of the city of Hangzhou, capital of the province of Zheijang, China. 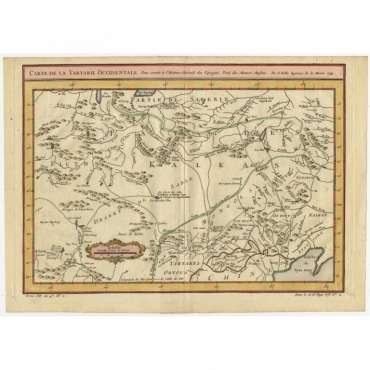 Antique print, titled: 'Carte de la Baye d' Hocsieu et des entrees de la Riviere de Chang situees dans la Province de Foyken.' - A map of the bay near Huchou Island, with the entries of Minjiang and Wulong rivers, located in the Fujian Province, China. 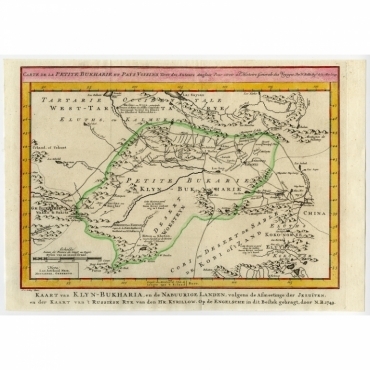 Antique print, titled: 'Carte de la petite Bukharie et pays voisins.' - A map of the Bukhari (Sinkiang in north-western China) and neighboring countries. 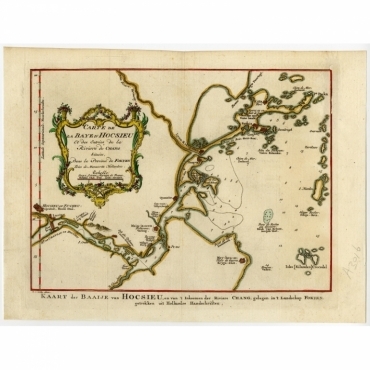 Antique print, titled: 'Plans de Quelques villes de la province de Hou-Quang.' 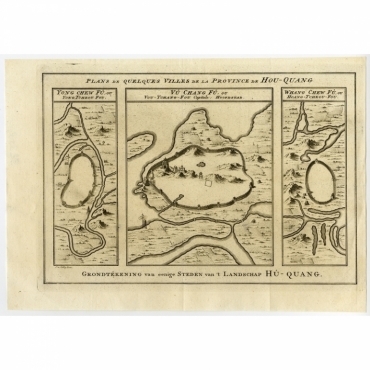 - Three plans of cities in a region named Hou-Quang (currently Hubei). 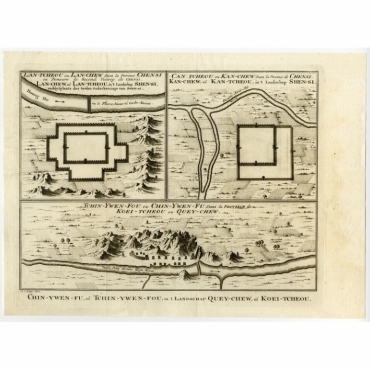 Antique print, titled: 'Plan de l' Enceinte de la Ville de Nan-King ou Kyang-Ning-Fou et plan de la ville de Su-Tcheou-Fou.' - A map of the City of Nanking or Nanjing. A second map shows Suzhou (?) in the Jiangsu region. 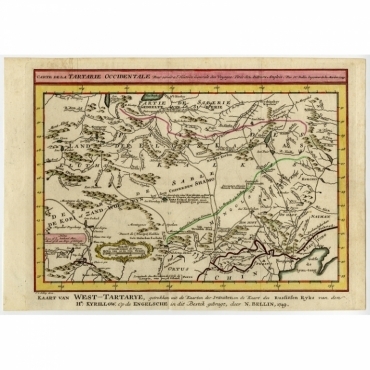 Antique print, titled: 'Carte de la Tartarie occidentale.' 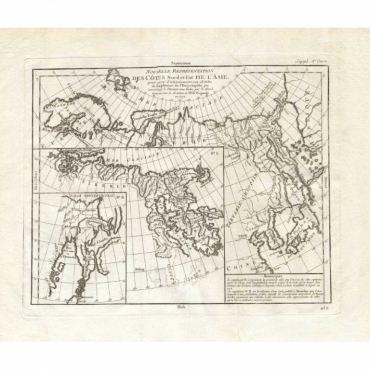 - A map of Eastern Tartary and the Gobi desert showing the silk road and the Great Wall of China. Antique print, titled: 'Lan-Tcheou ou Lan-Chew dan la province Chensi; Can Tcheou ou Kan-Chew dan la province de Chensi; Tchin-Ywe-Fou ou Chin-Ywen-Fu dans la province de Koei-Tcheou ou Quey-chew.' - Three plans of old Chinese cities. 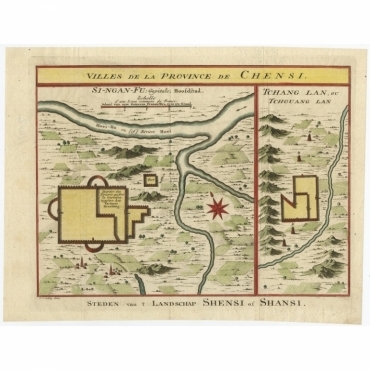 Antique map, titled: 'Villes de la Province de Chensi.' - Set of two local town plans of "Si-Ngan-Fu: Capitale, Hoofdstad." and "Tchang Lan, Ou Tchouang Lan. ", both cities in the province of Shanxi, China. 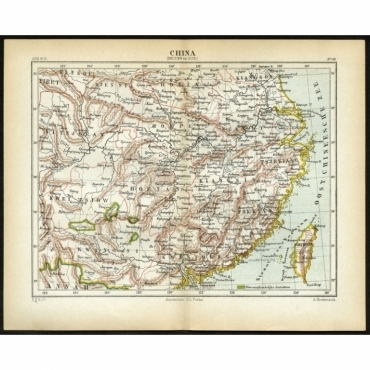 Antique map, titled: 'Carte de L'Empire de la Chine.' - Decorative map of the Empire of China, depicting China, Corea ( Korea ), Japan, Tonquin and the Philippine island Lucon. 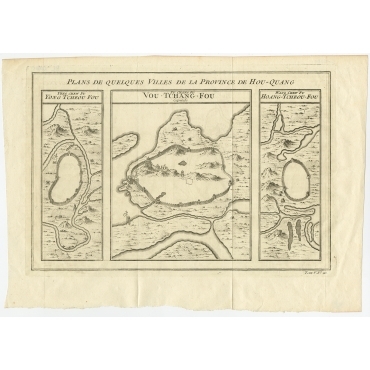 Antique map, titled: 'Carte de l'Isle de Cheu-Chan ou Isla de Chusan.' - This detailed map portrays the coastal area east of Ningbo in the Chinese province of Chekiang, located across the bay from Shanghai. The ornate title cartouche with a large compass rose orients the map with north to the right. Antique print, titled: ''China und Japan.'' - Map of China, Mongolia, Taiwan and Japan. 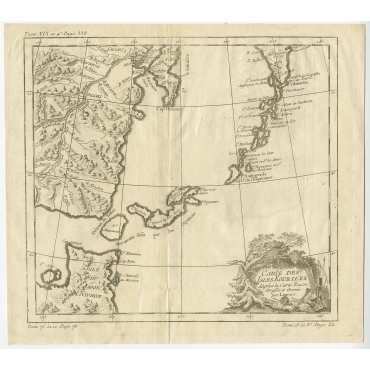 With an inset map of Jiaozhou Wan near Qingdao, and another of the region around Hongkong, including Kanton and Macau, with small plans of Hong Kong and Kanton.